I needed something that would be quick and easy to set up so I could continue taking pics even in winter. After some research on what could fit the bill, I decided that I needed to get a lightweight camera tracker so that I could just set it up quickly outside, set my camera up to shoot, and sit in the warmth of my car while the camera did its thing. There wasn’t much available at the time, as camera trackers were a rather new thing. Even now, choices are limited, but there were even fewer back then. My available choices were the Vixen Polarie, the AstroTrac, or the iOptron SkyTracker. After looking into each option in depth, I settled on the SkyTracker being the most versatile and the best bang for my buck.I placed my order and received my new mount a week later. As with the purchase of any new piece of astro gear (aka “cloud magnet”), I was greeted with cloud, rain and snow for the following 2 weeks, but finally the clouds parted and I got to use my new toy for the first time. Sure, the temperatures had dropped to -15ºC, but I was determined to use it. And it didn’t disappoint! Over the following weeks, I managed to snag my first successful images of several objects like M31, M45 and M47 – all targets I desperately wanted to shoot but had never been able to properly due to being ill-equipped for them. The tracking performance was outstanding. With a 300mm lens on my crop sensor Nikon (450mm equivalent) and a good alignment, I was able to easily track 2 minutes without trailing. Setup took about 5 minutes, so I wasn’t freezing to death by the time I started shooting, performance was remarkable while shooting, and teardown was a breeze after I was done. It was awesome! 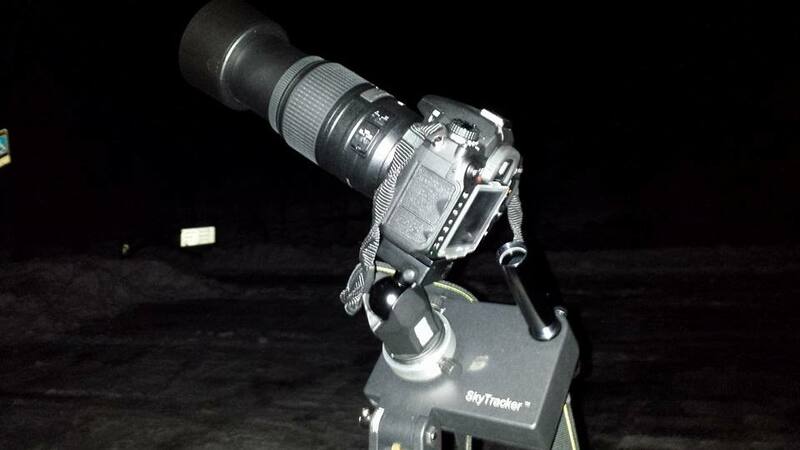 I wrote a review of the SkyTracker (which was subsequently published in Amateur Astrophotography Magazine) singing its praises as one of my first DAA blog entries. Over the following 3 years, this tracker saw a lot of use. I used it on half speed to do long exposures of the Milky Way. Where I had previously been limited to about 20 seconds of exposure time for Milky Way shots, with the tracker at ½ speed, I could get 40 second exposures while adding only minimal blur to my foreground. The ½ speed setting also made for great time lapse sequences of the Milky Way. 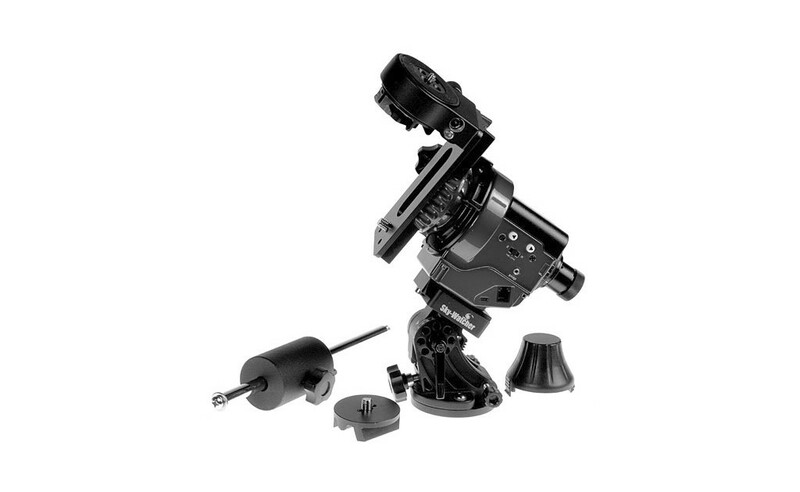 As a bonus, the SkyTracker could also be used as a 2-speed panning head for any time lapse photography. It was only in the last year that I really started using it for long exposure Milky Way photography, and it excelled at it. It produced some of the richest, most detailed images of the Milky Way I ever took. 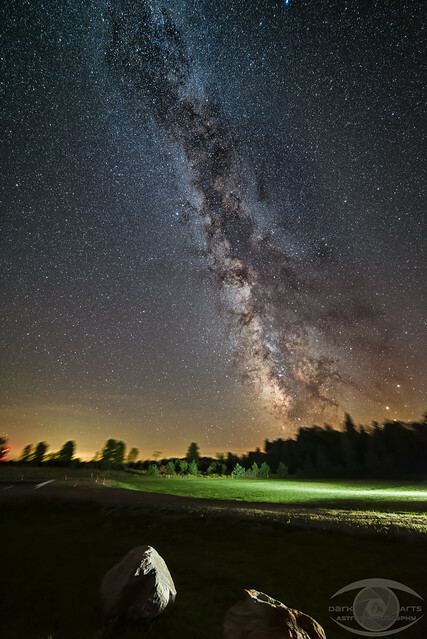 The image to the right, for example, is an incredible shot taken just a couple of months ago at the North Frontenac Township Dark Sky Preserve near Plevna, Ontario. It’s a 4 minute exposure that shows levels of detail unlike anything I had shot previously. This tracker was nothing short of awesome. But all that came to an end. It was on a dark, chilly night 2 weeks ago that I grabbed my equipment and headed out to the Dark Sky Viewing Area in hopes to do some imaging. My plan for the evening was simple. My 80mm ED scope would be trained on the Eastern Veil Nebula, and my other camera would be mounted to my SkyTracker and pointed at the North America Nebula with my 55-300 lens at about 200mm. I planned on getting a couple of hours worth of exposures of both targets. First I set up my scope, got it aligned, focused, and on target. Then I set the SkyTracker on my tripod and started to align it. I turned on the power. Nothing. I figured the batteries had died, which was no big deal since I always carry spares. I installed the new batteries, and still nothing. Try as I might, it wouldn’t power on any more. The famous words “It’s dead, Jim…” came to mind immediately. I’ve subsequently tried messing with it to see if I could repair it, but to no avail. So as winter approaches once more and the chances to get out with my scope get more rare, I’m stuck without my beloved SkyTracker. So I needed a replacement. This time, I needed something a little beefier, so instead of replacing it with the same thing, I decided to purchase a Sky-Watcher Star Adventurer. It’s more of a true equatorial mount than the SkyTracker and has several extra features such as a camera shutter release, guide port, more tracking rates, and a payload capacity high enough to even handle my Explore Scientific ED80 plus a camera. I’m not sure how well it will perform with said scope as opposed to camera and lens, but I’m sure I’ll determine that in the coming months. I had a gift certificate that had been given to my by the good folks at the Lennox and Addington County as an honorarium for the astronomy presentations I gave at the Dark Sky Viewing Area over the spring and summer. It was time to put it to use. Last night I called Focus Scientific in Ottawa and ordered the Star Adventurer Astro Bundle. It was shipped today (Nov 16) and I should receive it tomorrow. Expect a review of it in the coming weeks once I’ve had a chance to experiment with it. The forecast calls for clear skies on Friday. Hopefully the weather cooperates. I lament the loss of my trusty SkyTracker, but I guess this is the addendum to my original review. While it worked great and tracked accurately, its life expectancy is much shorter than I would have hoped for. While not very expensive compared to the other camera trackers available at the time, I expected a much longer service life out of it than what I got. I can’t say I’m too pleased with that. I had considered perhaps replacing it with the SkyTracker Pro, but decided against it and just going with a true equatorial head instead. I’m still going to try to get my SkyTracker repaired. My friend Kevin (also a SkyTracker owner) is quite handy at repairing electronics. He offered to take a look at it for me at some point in the future. If he manages to repair it, then I’ll have a SkyTracker for sale! Or perhaps I’ll have a giveaway of some sort. It remains to be seen. Till next time, keep those eyes and lenses pointing up.